You know when you spend ages crafting a main dish? And then, sweating profusely and with the time till dinner o’clock running out, you throw together a side dish? You with me so far? You know when the main is a bit meh, but the side is fabulous? Natch. It leaves me feeling both a bit annoyed and a bit happy, which can make me seem like a bit of a bi-polar dinner companion. On the one had feeling quietly satisfied (smug) that the side dish was good. But on the other hand feeling terminally depressed at the dullness of the main event. So, I was throwing together a weeknight curry (is it sad I get so emotionally involved with everything I cook? ), mixing a wicked smelling spice paste and decanting chickpeas from their tins. And I was leafing through my new – and already spice and oil spattered – copy of Curry Easy for inspiration. And then a saw a Bangladeshi Gujarati courgette yoghurt. I was intrigued. I use cucumber and yogurt a lot, but never courgette and yoghurt. And it all sounded so simple. And I always have courgette in the fridge – it’s ever-present in the vegetable box delivered weekly. Middle class, Moi? Surely not. It involved mustard seeds – always a favourite aromatic, Greek yoghurt, grated courgette and some cayenne pepper. It was smooth, thick and cooling, but with just the merest hint of an underlying heat, just enough to mitigate the luscious creaminess of the yoghurt and make it more interesting. A great counter point to anything spicy or full of chilli heat, and you get on of your five-a-day. Perfect. So easy, so quick, and it completely outshone the chickpea and potato curry, which wasn’t bad, just a bit bland. Mind you, it was better the next day mixed in with some cold left over rice the next day. Maybe it would have been better as a side with the yogurt and something more meaty/fishy/exciting as a main. Something involving aubergine or okra. I shall ponder and leaf through the book (which is ace by the way). Oh yes, and the parsnip chips in the photo were a real discovery. So much so that they’ll get a forthcoming post all to themselves. As I said above, this came from Madhur Jaffrey’s wonderful new book Curry Easy. It’s such a cheesy title for a lovely looking, fabric bound book with some great recipes. This is one of those wonderful dishes that can be prepared in advance or at the last minute. It tastes pretty good regardless. 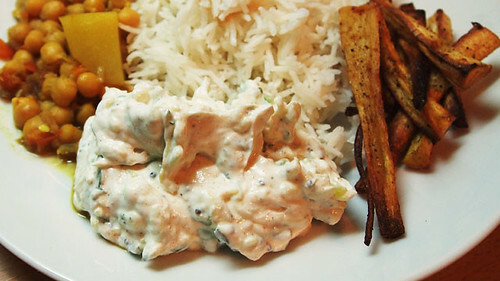 The courgette gives it more body that your average raita and it works really well as a stand alone side dish. The cayenne and chilli flakes give it some underlying oomph, but only in a background heat kind of way. They, together with the salt and pepper prevent it from being overwhelmingly creamy. The mustard adds a delicious aroma, a feast for your nostrils. You could also add cumin seeds too. The recipe calls for curry leaves to be chucked in to the oil at the last minute – that would certainly add yet more aromatic depth and is recommended. I just didn’t have any to hand. Put the grated courgette into a small pan with about an inch (2-3cm) of water in it. Bring it to the boil, cover and simmer on a low heat for 2 mins. Drain and refresh with cold water, then squeeze as much water out of the courgette as you can. Add salt, sugar, black pepper and cayenne pepper to the yoghurt and beat with a fork until creamy. Add the courgette and mix it all in. Put the oil in a pan (I use a small non stick pan for this) and heat it up. When it’s hot, add the mustard seeds and chilli flakes. The minute the seeds start to pop, remove the pan and pour everything into the yoghurt and stir it in.